Good news, Rabbit and Mouse are going on a picnic. Bad news, it is starting to rain. Good news, Rabbit has an umbrella. Bad news, the stormy winds blow the umbrella (and Mouse!) into a tree. So begins this clever story about two friends with very different dispositions. There are so many worthwhile picture books coming out this month that I may have to waive my self imposed 'one picture book a week' rule. Here's another one, surprise surprise no people get eaten in this one, so maybe my tastes are maturing! This is another example of a picture book that uses few words to create a great funny story. 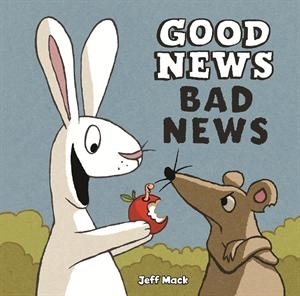 In this case there are only 4 words (technically only 3 separate words as news is used twice) used in the entire book, good news and bad news. We have seen similar titles before, with books like Fortunately by Remy Charlip and Unfortunately by Alan Durant, but that doesn't make this book any less impressive. A rabbit wants to share his picnic with mouse, but rain threatens to wash them out, good news is they have an umbrella, bad news, umbrella is blown away with mouse attached, good news, a tree stops him going too far...and so on. It's the illustration in this story that really make the humour stand out. Throughout every good and bad thing that happens, rabbit remains positive, but mouse is finding it difficult to keep his spirits up. When it all gets too much, mouse loses it...and rabbit looks like he may not be able to see the good news in that!